Ossett Market Place in the 1940s and 1950s in a sketch entitled "Sunday Morning" or "At your Convenience." Bainbridge’s and The Cooperative shops are shown in the left background with the Ossett War Memorial before its subsequent move to a new location in the Market Square. 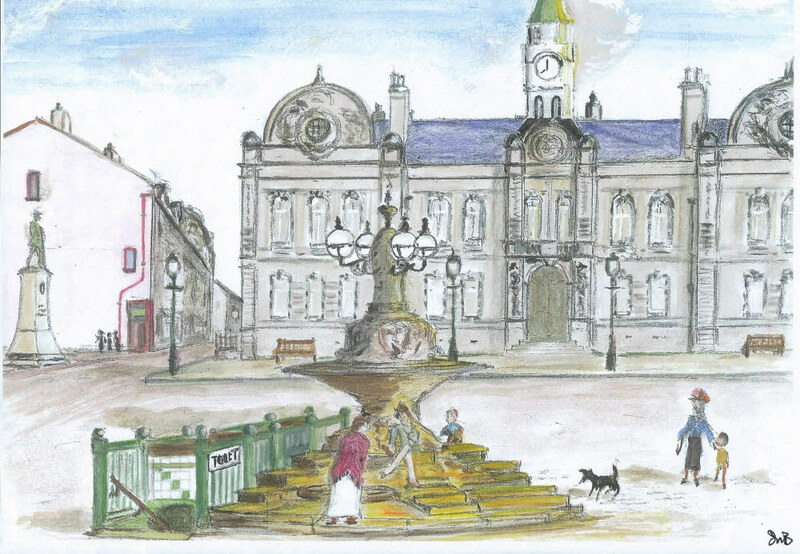 Hannah Pickard’s Fountain takes centre stage in the Market Place and with the nearby underground Public Conveniences provides the foreground for the Town Hall to the rear. The tiled conveniences were lovingly and spotlessly maintained by Harry Sugden.